With grey skies and pretty much solid rain forecasted, it was a good day to be inside. Thankfully, UkraineLab planned the weather perfectly for a day of digging into theoretical questions behind impact places. Participants split up into four workshops to tackle some key issues on everything from holacracy to the concept of „third places“. How does a building become somewhere that changes a community? How can you effectively attract and manage stakeholders? How should you go about self-organisation? These were some of the big questions on the day’s order. Thankfully, theoretical at UkraineLab doesn’t mean passive. The day was filled with interactive tests, lively discussions and fascinating input from trainers from a variety of organisations, for example from the minds behind the 86 Film Festival and the founders of the NGO Garage Gang. 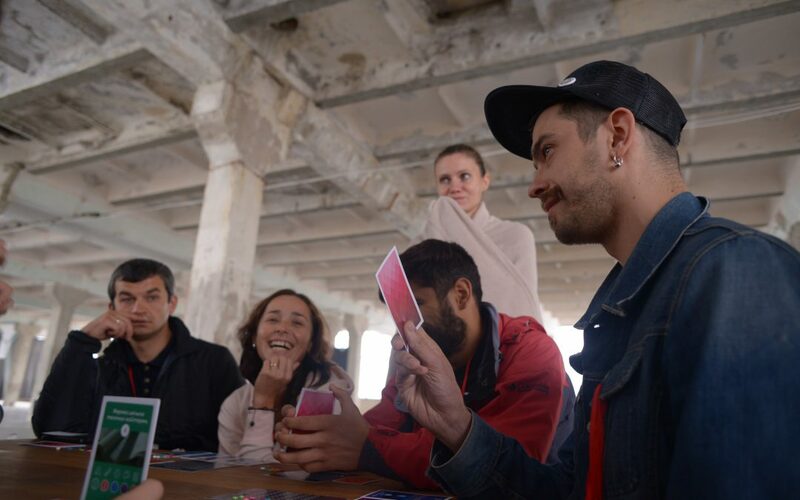 The latter were even responsible for bringing a board game that allowed participants to play through different strategies for project investment, a kind of Monopoly for civil society. It was pretty cool. After a productive day, it was high-time for some entertainment. This came in the format of the cheekily named „F**k-up Night“. In practice, it was a space for people to share their, often hilarious, stories of difficulties, mistakes and times things didn’t work out quite as planned. As one participant commented afterwards, „We don’t talk enough about our failures. It was so great to hear stories that made you realise that you’re not the only one who’s had a problem.“ And it really was a supportive space for people to talk openly. Even the most successful people have had their messes. Thank you UkraineLab for this time to share.